PokerStars misses the asterisk convention! When I signed up for PokerStars.com I noticed something funny. It happened when I got to step two in the registration process. In this step I was supposed to enter my personal information but I got very confused when I thought I had to fill out my date of birth, street address and zip code but not my name or e-mail address. The confusion was all about the asterisk. 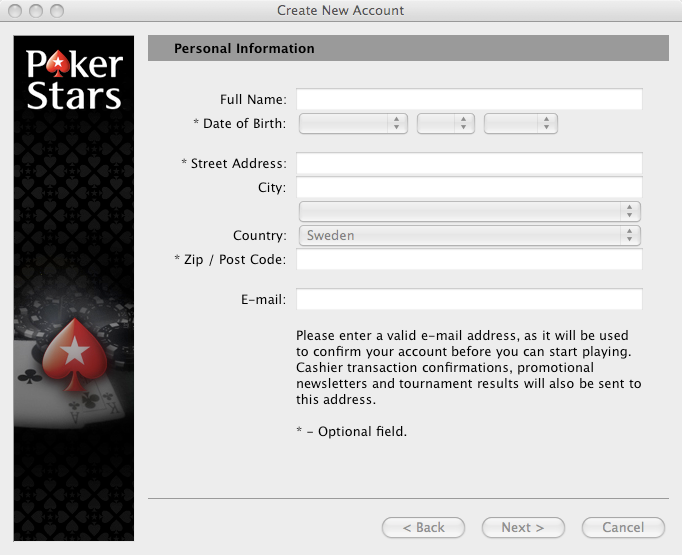 An asterisk in a form means required, but at PokerStars.com it means optional. The text “* – Optional field” is placed at the bottom of the form which means that the player probably won’t notice it until he has completed the form. This would be ok if all the other websites in the world used the same convention. But the convention on the net is that an asterisk means required and changing the meaning will just confuse your players. I’m actually a little surprised that one of the largest poker sites have missed this.